The reporting requirements for claiming charitable contributions of cash on your tax return can be strict. If you don't follow them, your deductions may be disallowed by the IRS. You should also be aware that stringent rules also apply to donations of non-cash property. If you use part of your home as an office and take deductions for related expenses on your annual tax return, can you claim a valuable federal tax break when you sell? Specifically, can you claim the home sale gain exclusion of up to $250,000 for single taxpayers ($500,000 for married couples filing jointly)? In many cases, you can still take advantage of this tax benefit. 1. You must have owned the property for at least two years during the five-year period ending on the sale date (referred to as the ownership test). 2. You must have used the property as a principal residence for at least two years during the same five-year period (referred to as the use test). To be eligible for the $500,000 joint-filer exclusion, at least one spouse must pass the ownership test, and both spouses must pass the use test. If you excluded a gain from an earlier principal residence sale, you generally must wait at least two years before taking advantage again. For joint filers, the $500,000 exclusion is only available when both spouses haven't claimed an exclusion for an earlier sale within two years of the sale date. Take photos to prove the room was used for business purposes in case of an IRS audit. To figure the percentage of your home used for business, you can use two methods — square footage or the number of rooms. Home office deductions can't exceed your income from the related business activity. But if they're greater, you can carry the excess deductions forward to a future year. If a home office is required by an employer, it's a good idea to get a written statement from the company explaining the requirement. As long as your deductible home office space is in the same dwelling unit as your residence, you can use the gain exclusion to shelter profit from the entire property. In other words, you are not required to split the sale into two separate deals for tax purposes (one transaction for the sale of the residential part of your property and another for the sale of the office part). However, you will be taxed on gain up to the amount of depreciation deductions on the office part of your property that were claimed for business use after May 6, 1997. You will owe a maximum federal rate of 25% on this profit (called unrecaptured Section 1250 gain). However, paying tax on this portion of your profit is not really so bad, considering that you collected earlier tax savings from the office part of your property. The tax outcome is less favorable when the office is not in the same dwelling unit as the residence. For example, say you claimed home office deductions for what was formerly a carriage house, garage or finished basement with cooking and bathroom facilities and a separate entrance. In these cases, even though the office is on the same property or in the same building, it is considered to be a separate dwelling unit that is not part of the residential portion of your property. In these scenarios, you must pass the ownership and use tests (see right-hand box) for both the office portion of your property and the residential part in order to treat the sale as a single transaction that is eligible for the gain exclusion. If you fail the tests for the office part (for example, because it was used as a deductible office for the entire five-year period ending on the sale date), you must calculate separate gains for the office and residential portions of your property. Then, you can use the gain exclusion only to shelter profit from the residential part. Any gain on the office part is usually fully taxable. You will generally owe a federal income tax rate of no more than 25% on gain up to the amount of post-May 6, 1997 depreciation. Any remaining profit from selling the office part of your property will be taxed at the regular capital gains rates. Contact your EHTC Tax Advisor if you are contemplating the sale of property with a home office. Advance planning may be necessary to maximize your tax savings. Background: Generally, you can deduct 50% of your meals and all incidental expenses when you are away from home on business. The IRS considers you to be "away from home" if business duties require you to leave the general area of your tax home substantially longer than an ordinary work day and you need to sleep or rest in order to meet the demands of the job. 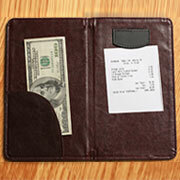 When Are Meal Deductions Allowed? Meal expenses are generally deductible only if a business trip is overnight or long enough that the taxpayer needs to stop for sleep or rest to properly perform his or her duties. The amount of the meal expenses must be substantiated, but instead of keeping records of the actual cost of meal expenses, a taxpayer can generally use a standard "per diem" meal allowance. The amount allowed varies, depending on the travel location and time of year. Generally, the deduction for unreimbursed business meals is limited to 50% of the cost that would otherwise be deductible. For these purposes, your tax home is your regular workplace, regardless of where you actually reside. Therefore, if you're merely grabbing 40 winks in between shifts, you probably won't qualify for meal deductions. Conversely, if you need an extended nap before resuming work, you may be in line for tax breaks. In the Tax Court case, meal deductions were claimed by a ferryboat captain who normally worked 15 to 17 hours a day for seven days, with the next seven days off. The captain was employed by a company based in Seattle, Washington, which carried travelers on turnaround voyages to destinations on Puget Sound. During the peak season one year, the taxpayer had a layover of one hour, increasing to five hours the next two years. In the off-season, the captain's mid-cruise layovers were six hours long. At the end of a workday, the captain usually did not have time to return to his personal residence for dinner. On account of an early starting time and long commute to and from his residence, he slept on a cot stored aboard one of the company's vessels. The company did not require him to stay overnight, pay him during this time or provide an allowance for meals or incidental expenses. The captain deducted the expenses on his tax return. The IRS denied the captain's meal and incidental expense write-offs because he was not "away from home" under the tax code definition "because his voyages did not require him to obtain sleep or rest." However, the court found that it was reasonable for the captain to obtain sleep or rest so he could meet his job demands. He was responsible for his crew and the safety of up to 1,200 passengers on voyages. As a result, the court ruled that the six-hour layover resulted in the taxpayer being away from home in the off-season. Once sleep or rest is required, 50% of the cost of his meals could automatically be deducted, even if these expenses were of a purely personal nature (for example, there was no substantial business discussion with a customer or client). In addition, the Tax Court determined that the workday was long enough to use the standard per diem rate without prorating the amounts. Can other taxpayers take advantage of this case if they work long hours? There's no definitive time established for the "sleep-or-rest" rule. However, the courts are likely to rely on critical situational factors if it's a close call. In the case described above, the Tax Court stated: "The factors to consider in determining whether [the taxpayer] needed sleep or rest include his age, his physical condition, the length of his workday, and the importance of being alert so that he could carry out his job's responsibilities without fear of injury to others." The U.S. Tax Court recently ruled that the Boston Bruins hockey team's pregame meals to players and personnel at out-of-town hotels qualified as a de minimis fringe benefit under the Internal Revenue Code. Therefore, 100% of the cost of those meals could be deducted — it wasn't subject to the 50% tax code limitation. It's already starting to feel like summer in many parts of the country. But the forecast for Washington remains unclear as officials continue to discuss various tax-related issues. The Section 179 deduction for qualified real property expenses was made permanent under the Protecting Americans from Tax Hikes (PATH) Act of 2015. However, claiming this deduction isn't a no-brainer. Here are the pros and cons.